I love this fabric. 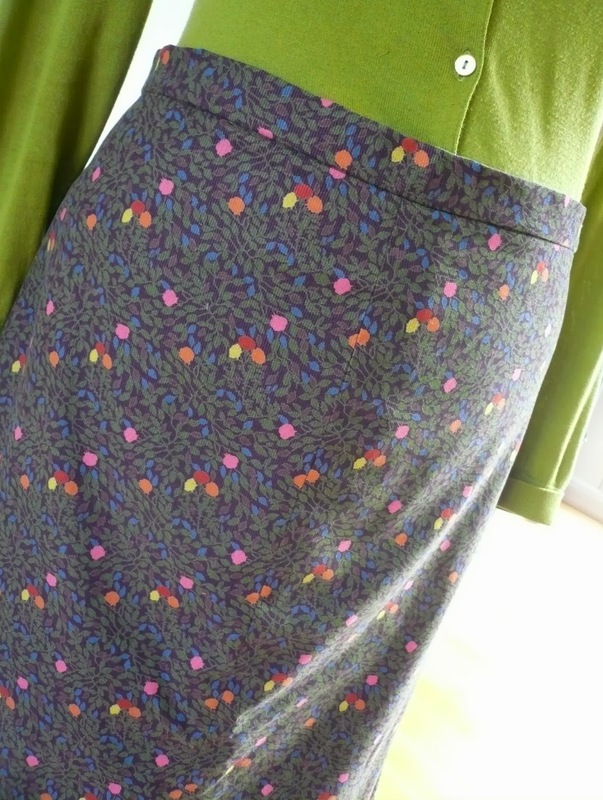 I've made countless half aprons and purses with it to sell at craft fairs and it's always popular. 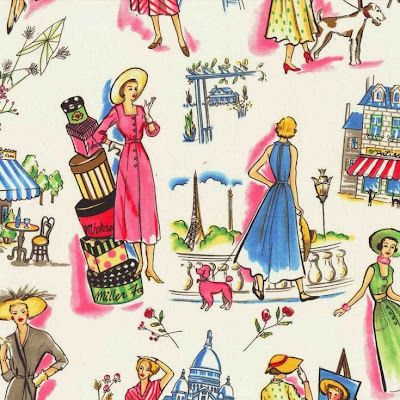 I can also see it working as a fab, 1950's-style dress, Dolly Clackett style! 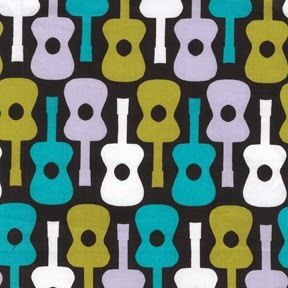 I'm drawn to this one simply because it reminds me of my husband's wedding tie. And this one caught my eye because it just looks plain bonkers! 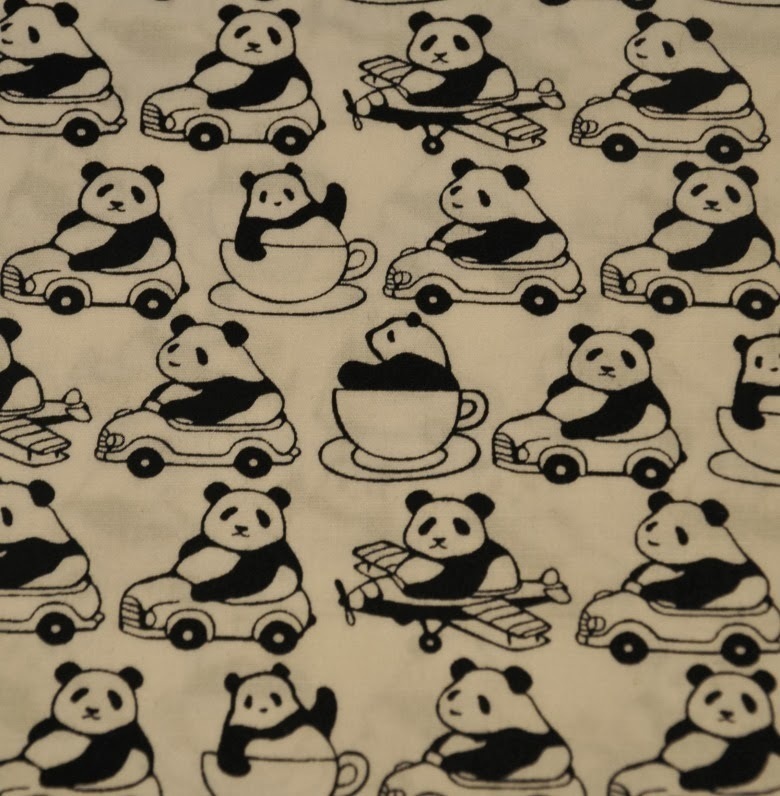 If you half close your eyes, it almost looks like a 1930's print (sort of!) 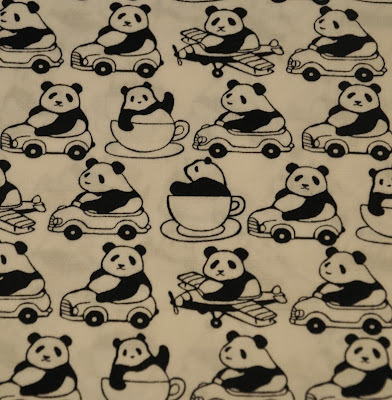 The pandas are only tiny (2cm) - I'd love to make a 1930's blouse with it and see how long it takes people to notice them! I could go on (and on and on) but I'm sure you'd prefer to get back to the giveaway... One lucky winner will win this lovely vibrant FQ bundle of Blend fabrics, all from the Paisleigh Collection by Maude Asbury. But that's not all! Louise is also very generously offering the winner a metre of fabric of their choice, hoorah! To enter the giveaway all you have to do is take a look at Sew Scrumptious Fabrics and leave a comment on this post telling me which fabric you'd choose if you won. The giveaway is open internationally and closes at midnight GMT on Sunday 1st December. The winner will be chosen at random. My November make for the Minerva Blogger Network is the Lady Skater dress by Kitschy Coo. The Skater Dress was originally released as a children's pattern, but so many people asked owner Amanda to make a larger version that she eventually caved in and drafted a grown-up version for us Lay-dees. I'm so glad she did because for me, finding this pattern was like finding the Holy Grail. I'm really not joking either - I've been on the hunt for a basic knit dress pattern forever. I mucked about with the Colette Peony pattern in the past (here and here) and to be fair, I was more than happy with the results. Both dresses get a lot of wear, the problem was that I felt I was floundering a bit during the sewing process and very much making it up as I went along. Having a perfectly drafted pattern that ticks these boxes, along with excellent online instructions, has made this dress an absolute BREEZE to sew by comparison. You choose your size according to your high bust and high waist measurements. Annoyingly, I was slap bang in the middle of a size 4 and a size 5, so blended between the two sizes, cutting a 4 around the waist, hips and neck, and a 5 in the bust area. Amazingly, this seemed to work! Amanda strongly advises making a test muslin of the bodice fit, which for once, I fully intended to do, but the fit was pretty good so I just steamed ahead. I added clear elastic at the shoulder and waist seams as directed and they really help give the dress shape and hold the weight of the fabric. The other thing I've always struggled with when sewing knits is the neckline. They're either stretched, or too baggy, or just plain rubbish. The neckline instructions on this pattern are ACE. The only changes I made to the pattern were to shorten the arms to allow for my T Rex affliction and to shorten the skirt very slightly. There's a super helpful bit in the pattern that indicates exactly how long the dress is in its original state. If you're interested, it's designed to just hit the knee if you're 5'5". For fabric, I used a medium/heavy weight Ponte Roma jersey in Forest, which is a lovely quality. Soooo smooth and silky, I keep having to stop myself stroking it, it's so touchable. If you fancy making your own knit dress, then you can purchase the Lady Skater dress kit from Minerva Crafts here. The kit comprises 2m of Roma jersey in Forest, matching thread and a pack of clear elastic. This amount of fabric is enough to make a size 5, long sleeved Skater Dress and a practice bodice if you're that way inclined. It may surprise you to learn that the most popular post on my blog by a long, long way is this one on Craft Fair Tips. I struggled to find similar advice when I first decided to sell at craft fairs myself, so it really pleases me that people are benefiting from the tips in the post. One tip I give is a list of handmade items that sell well for me. Some items, such as lavender bags, wash bags and tooth fairy cushions, will always sell well. Some aren't quite as popular, so from time to time, I like to introduce a few new lines to keep the stall fresh and up to date. As my first craft fair of the Christmas season is this week (yikes! ), I thought I'd share my new additions with you. You never know, they may inspire you or spark off an idea of your own. These are very quick to make and great for using up long, thin scraps of fabric. It's also good to have a few low priced items on a craft stall and these are ideal. Not exactly the correct season for peg bags, but I've made these because I get asked if I sell them at every single craft fair I'm at. Just watch, now that I've made them, nobody will be interested! I think they work best made from tougher, decor-weight fabric which is strong enough to hold an army of pegs. I was sent my own polka dot notebook (which I use all the time incidentally) by Dottie Doodle as part of the Spring Sewing Swap. I used her tutorial to make a few and have a feeling they'll be popular. I can't see how a young girl wouldn't want one, especially if they're as obsessed with stationery as I was as a teenager! And when you've finished writing your memoirs in it, simply replace the cheap notebook inside (I got mine from Tesco) and keep the lovely fabric cover! As with the Travel Card Holder, I think they're lovely, slightly unusual gifts for friends to buy for each other. Last but not least is something sewing related. The idea for this was conceived after I received a FQ of tape measure fabric as a gift from Marie at A Stitching Odyssey. But what to make with it? I decided on a sewing kit - a small zipped purse, lined with a plain fabric and containing a sewing kit. These particular sewing kits are available in a lot of shops and supermarkets. I think it's a nice touch if the outer purse fabric features a sewing print. So as well as the tape measure version, I also made a few using some vintage pattern fabric from my stash. Endlessly useful and a great stocking filler. Thank you all for your helpful comments and advice on my last raincoat post. There were some fab suggestions, but in the end it was a toss up between vintage McCall's 8006 and Simplicity 5928. The Simplicity pattern won, for the simple reason that Amy of Sylkotwist had a copy of the pattern and very generously let me borrow it - thank you! I did love McCall's 8006 but just couldn't track it down. Simplicity 5928 is a princess seamed pattern from the Look Slimmer range (hoorah!) and has some lovely details such as top stitching and concealed side pockets. 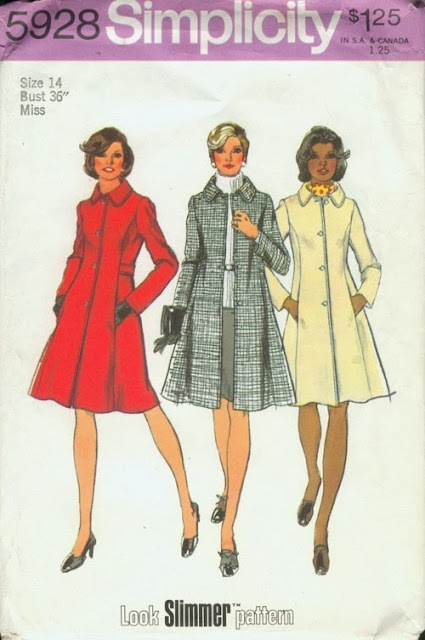 Amy's copy of the pattern is a size 14.5, with a 37 bust, I would normally go for a vintage 36 bust, but as the coat has very fitted princess seams, I'm quite glad of the additional room. So far, I've pinned the pattern pieces together and fitted them to Angie. The fit seems pretty good and I'm tempted to just steam ahead without a muslin. The only anomaly I found with the pattern is the length. Simplicity half size patterns are designed for petite women, or to be more accurate, specially sized for Misses and Women about 5'2" to 5'3". This seemed like a dream come true for me as I'm exactly that height and almost always have to shorten patterns to fit. It wasn't quite that simple though. The envelope illustration clearly shows the length of the coat skimming the knee, yet on Angie, (who's more or less my height), it's virtually ankle length. 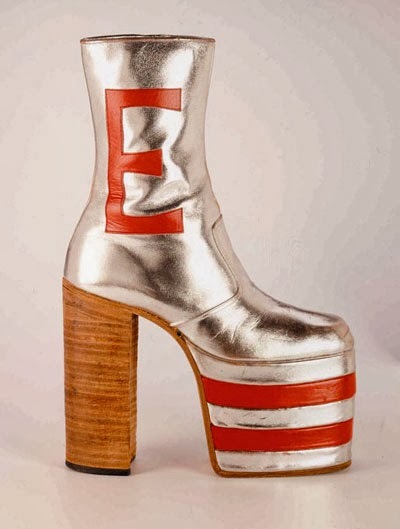 I tried to make allowances for the fact that the pattern is from 1973, and as we know, the entire population walked round in towering platforms like this. But the girls on the envelope are all wearing sensible court shoes, which sort of blows my Elton John massive boot theory out of the water. It's very odd, and even taking the generous 2" inch hem into account, I'll still have to shorten the pieces by about 4 inches. Harrumph. For fabric, I'm using a waterproof coated microfibre fabric in navy from here. This is the same type of fabric that Winnie used for her Robson Trench and I'll be utilising all the sewing tips she included on her post. They were primarily to use weights to cut the fabric out (which I do anyway), use hairgrips for seams and DON'T USE PINS! This is all new to me so I'm looking forward to the challenge. ...or this lovely flash of gorgeousness. Any preferences? Just look at that header! Cherries!!!! And buttons!!! Hoorah! If you're wanting to freshen up the look of your blog but don't have the necessary design skills and are on a limited budget, then I can't recommend Trina highly enough. 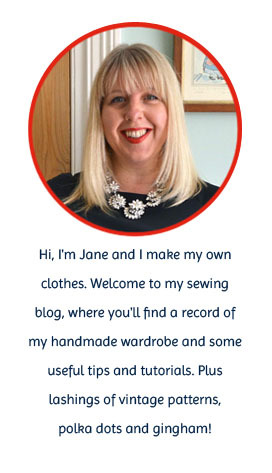 Now that my blog has a professional new look, I'm also pleased to offer affordable sponsorship for suitable stitchy businesses. Sponsors need to be a good match for my blog and of interest to my readers. So if you have a sewing, fabric, pattern or vintage-related business, I'd love to work with you! Please contact me (via my shiny new email icon!) for details of my rates and options. It's been a bit quiet on the garment sewing front recently - we've had half term holidays and I now have a sick child at home (oh joy! ), so there's not much to show off that I've made for myself. I have however, managed to squeeze in a rare bit of unselfish sewing. Yes, don't adjust your sets, you read that correctly! Sewing for others doesn't come naturally to me I'm afraid, it works out at about one item a year, so today's make is my contribution to 2013! It's a skirt for my mother-in-law Audrey. Please don't ask me how I made these changes because I really can't remember, I just made it up as I went along. But I DID actually go to the trouble of making a muslin. 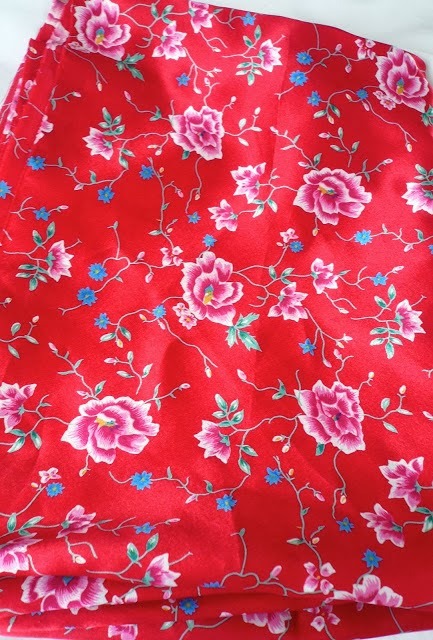 This was mainly to check that the changes actually corresponded with Audrey's measurements, but also because I was nervous of hacking into the beautiful fabric she'd chosen - a very stylish Liberty print fine cord. It has very muted background colours (a dark plum colour and olive green) coupled with bright fruits of some sort (mulberries maybe or rose hips?) to liven it up. 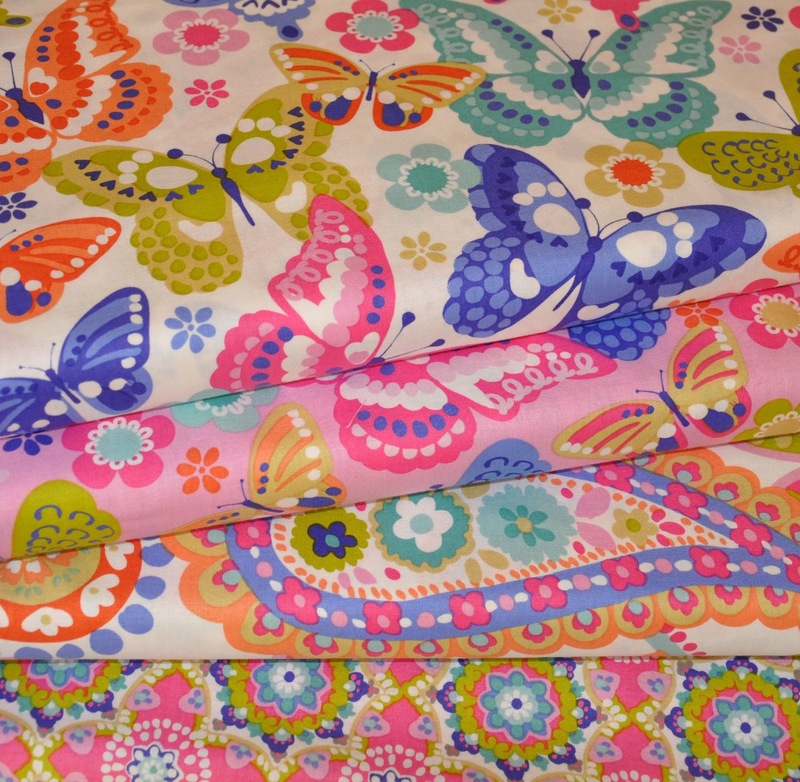 Anyway, the fabric - Isla Rose - came from Sewbox, who stock a great range of Liberty lawns, cords and jersey prints at knock down prices. I also fully lined the skirt with an olive green dress lining to prevent the cord being too clingy. I'm happy with the final look of the skirt, although it seems to have lost an inch in length during the construction process! I'm truly flummoxed by this as I measured everything VERY carefully, but maybe my abysmal maths skills had something to do with it…. The skirt is well below the knee as it is though, so fingers crossed this won't be too much of an issue. Mystery lost inch aside, it has the classic, smart look I was hoping for which I'm relieved about. I'm also relieved I've finished this project, partly so that I can actually give my mother-in-law her belated birthday present, but also because I find sewing for others much more stressful than sewing for myself. Does anybody else find that? For some reason, the stakes seem higher and there's more of a self imposed pressure to get everything exactly right. I think she'll like it though, it's very much her style.